The first issues by Italian states were in 1851. Sardinia’s first (on 1st January) sells for £1,600 and so is represented by a commemorative. 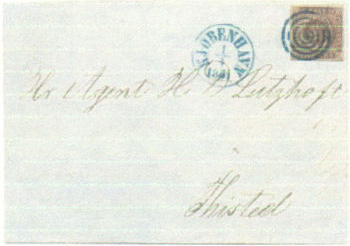 Tuscany’s earliest issue was on 1st April 1851, including the (£6,000) Sc2 SG4 1 soldi ochre and the stamp shown, the 2 crazie blue (Sg11, Sc5). The £4,000 1 quattrini black (SG1, Sc1) was issued on 1st September 1852. Sardinia raises the question of which stamp should be collected as the first issue: some collect the first catalogue entry (the Scott or Gibbons number 1); others the first issue by date; completists the first set; the frugal, the cheapest in the first set when there are significant price differences. Here again, the first stamp issued was not the catalogue first but rather SG2, Sc2, the 4 rigsbank skilling brown on 1st April 1851. The 2 rbs blue (SG1, Sc1) followed on 29th April. First issue first day covers are rare and, in this period, invariably expensive. 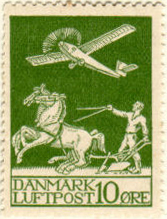 The Denmark cover shown here sold in April 2007 for €52,000.